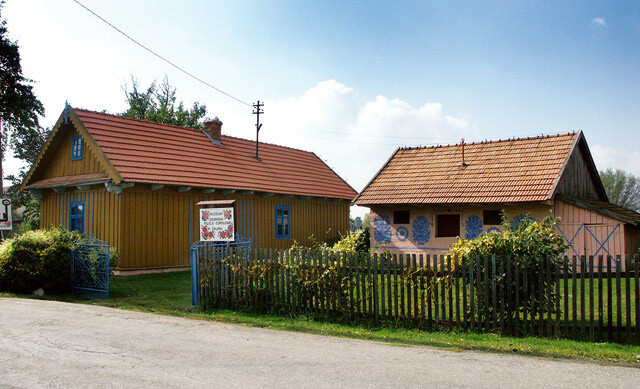 Felicja Curyło’s Household, a branch of the District Museum in Tarnów, is located in a picturesque village called Zalipie in Powiśle Dąbrowskie. Although this village is one of a kind, it is not the only one in this region where the custom of painting houses and their interiors with floral patterns has been preserved and developed for generations. This ornamentation began probably at the end of the 18th century and was connected with the disappearance of chimneyless cottages. Women painted sooty walls with lime to brighten the interiors of their cottages and make them prettier. Felicja Curyło (1904-1974), an outstanding painter, was the promoter of this unique folk art. Already during this artist’s life, her house was visited by many people and, over the years, it became the most important place for all those interested in folk art. This cottage was preserved in the same form as it was during the painter’s life. External walls of buildings in this household are covered with floral ornaments. In the hall, there is an interesting black ceiling with white patterns painted with clay. This technique relates to the oldest painting tradition in Zalipie. The walls are decorated with paintings on paper and cut-outs. In the rooms, the ceilings and walls are abundantly decorated with paintings made directly on the plaster as well as “carpets” and small tapestries painted on paper. The traditional cloths from this region, made by Felicja Curyło herself, are very eye-catching. The rooms are also decorated with items made of colourful tissue paper: spiders, wedding rods and colourful bouquets. The kitchen is a room that is very richly decorated. 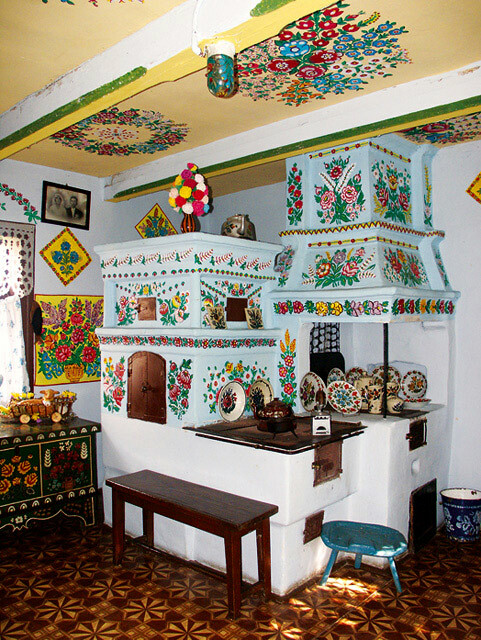 Here, first of all, you can see a traditional oven, painted blue, and covered with multicoloured painting with floral motifs. Not far away from the cottage of Felicja Curyło, you can see an abundantly decorated cottage, fully equipped, owned by an outstanding painter and poet, Stefania Łączyńska, who is a representative example of traditional ornamental art in Powiśle Dąbrowskie. 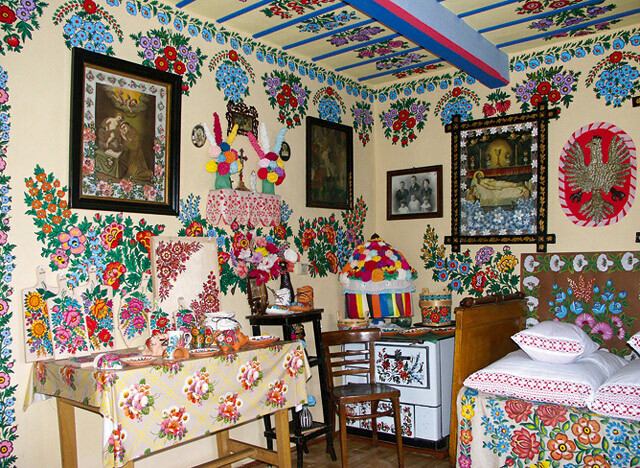 This place provides a wider view of the folk art in this region and constitutes the only opportunity to enter such a painted house because those houses in this region are not open-air museums but real houses where people live. This cottage is characterised by its thatched roof and walls painted with lime. The only decorative elements and very beautiful ones are the floral paintings on the external walls of this building.